Access all of the resources you need to understand the elements of a Digital Workplace and how it impacts your business and your employees, too. Our webinars, whitepapers, blogs, and video demonstrations provide you with all of the tools and information your business needs to plan for a Digital Workplace as well as implement a successful strategy to evolve to a Digital Workplace. Take a journey into a Digital Workplace, its components, its benefits, and how your business can evolve to a Digital Workplace. Register today to jumpstart your Digital Workplace transformation with our three-part Digital Workplace Webinar Series. Part 2: ​What is a Digital Workplace? How does Office 365 become one? SP Marketplace's Digital Workplace Blog discusses, analyzes, and interprets information, perspectives, and opinions on a Digital Workplace. Type "Digital Workplace" into Google and the results are endless pages of articles, whitepapers, eBooks, videos, and more. Your opinions, ideas, and perspectives matter just as much as ours here at SP Marketplace. Share your thoughts and engage with other professionals and businesses who have already realized the benefits of a Digital Workplace. ​It's always beneficial to get a second opinion; that's why here at SP Marketplace we have compiled a list of articles and resources from some of our colleagues and Digital Workplace enthusiasts. Why do most organizations ignore the digital workplace? Looking for a resource, article, or link not listed here? Reach out to us and we will provide you with exactly what you need. 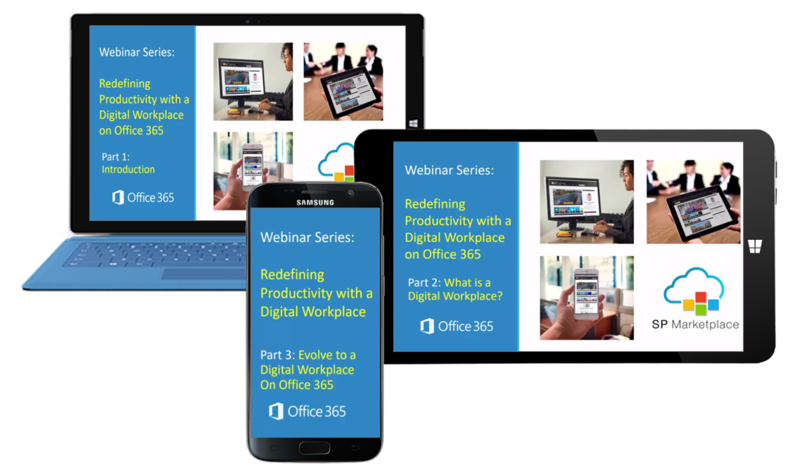 SP Marketplace Digital Workplace Solutions on Office 365 and SharePoint are redefining how work is done in over 1000 organizations around the world. See what it can do for you.